The Rebel Sweetheart. : Win a Date with SHINee! 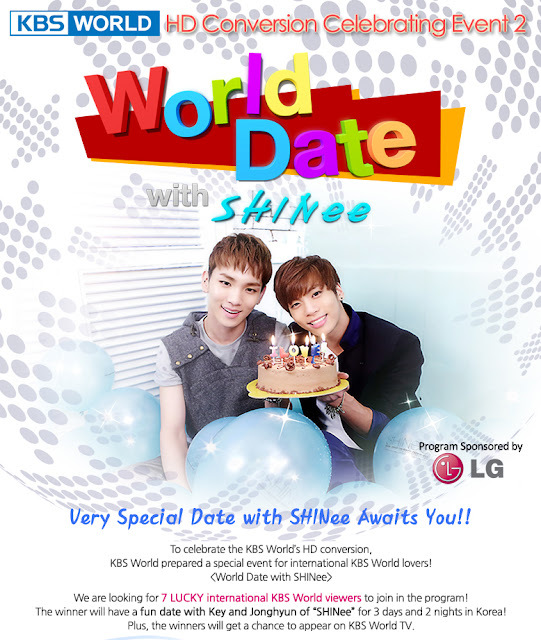 KBS World and LG are giving seven - that's right, seven - international fans this once-in-a-lifetime opportunity to go on a date with Jonghyun and Key of SHINee! Winners will also have the chance to appear on KBS World Program - how chongmal daebak (totally awesome) is that?! Also included in the prize package are round-trip tickets to Korea, travelers' insurance, accommodation, transportation, and meals for the duration of the filming. That's a five-day, four-night experience in Korea! If you're aged 19 and up, and a huge fan of SHINee, this is an opportunity you wouldn't wanna miss! Full details of this contest can be found here.